Whether you live in the cold North and need the high-efficiency of a condensing gas furnace or the moderate South and can do just fine with a little less efficiency, you'll still enjoy ultimate comfort with these Infinity series furnaces. Variable-speed blower technology and a two-stage gas valve help make them very quiet, not to mention efficient. If that's not enough, Comfort FanTM technology and other Infinity level features are sure to please. 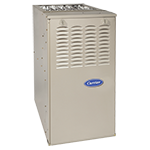 Models include condensing and non-condensing furnaces. 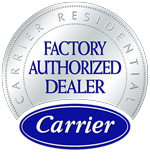 The CVX furnaces are approved for use with natural or propane gas, and for use in Low NOx Air Quality Management districts. Efficient, quiet, flexible and durable, these powerful furnaces live up to their Performance name every day—no matter where you live.Highly efficient Performance 96 is ENERGY STAR® qualified and lets you enjoy the comfort of variable-speed blower-motor technology. It's Hybrid Heat system® compatible, so you can enjoy the smartest kind of heating savings year after year.